BLΛCK SΛLIVΛ /blog » All that glitters isn't gold - but it's still damn F.U.N! All that glitters isn't gold - but it's still damn F.U.N! You know, I got excited about nail polishes pretty often (well, more like everyday), but it's rare I get this excited! 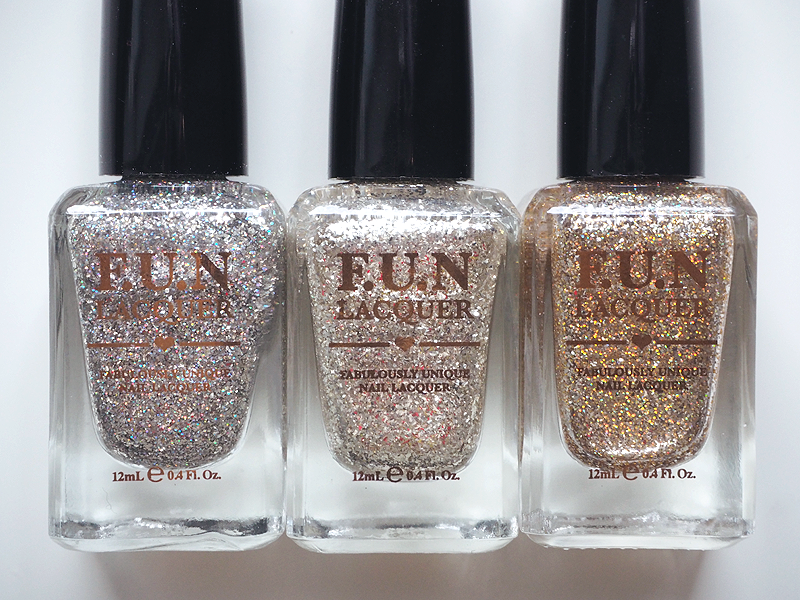 My favourite polishes are those with glitter and when we're talking about glitter polishes, a singaporean indie polish brand, F.U.N Lacquer, has one of the best ones I've seen so far! The more it sparkles, the better it is and these ones are definitely not lacking on the sparkle-factor. We just recently got this brand to Finland and I had to purchase my three favourite colors right away, before they will sell out. The prices for a bottle start at 17,60€ and you can purchase them from CesarsShop.fi. International buyers can check the brand's own bigcartel store. The colors I got, are Queen, Pay Day and King. I also wanted to get Galaxy, but I heard there was some problems with it's ingredients/formula, so I will get that a bit later. 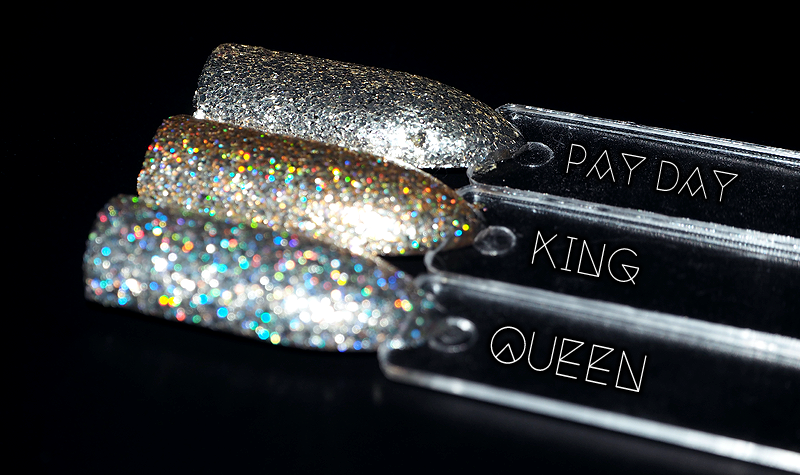 Both King and Queen are foil effect holo glitter polishes. While King is gold, Queen is the exact same thing but in silver. An absolutely gorgeous duo. Pay Day is a bit different though and I would say the color is closer to being platinum than plain silver. It's just so damn pretty and even though it's hard to decide my favourite one between these three, I think I'll have to pick Pay Day, because of it's uniqueness. F.U.N (which comes from the words "Fabulously Unique Nail lacquer" btw and isn't kidding when stating so), describes Pay Day as not a glitter polish, but a polish with metallic, mirror-like finish. It also contains real sterling silver flakes and is breathtakingly gorgeous in person. Btw, PD applies really smooth and doesn't feel coarse even without top coat, which is rare with all kinds of glitter polishes. Pictures with black background are taken with flash and the ones with white background are taken in natural light. 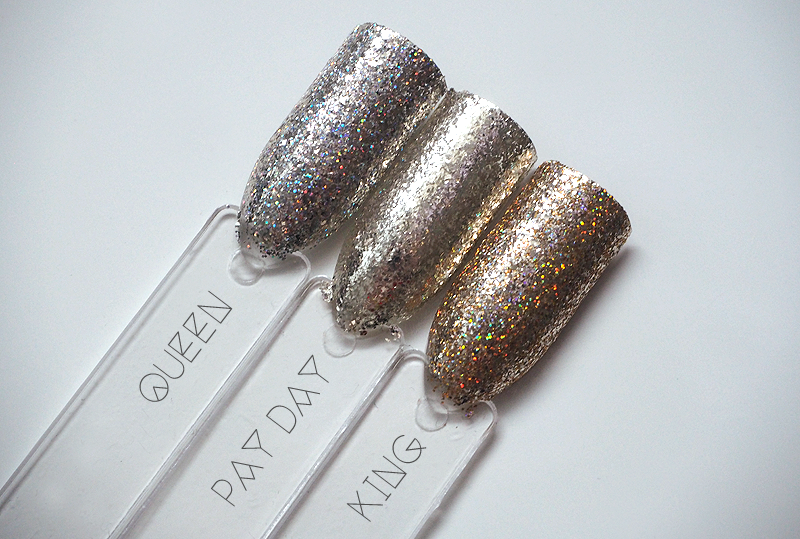 The picture above shows the holographic sparkle of King and Queen, and the picture below gives an idea of Pay Day's mirror effect. I still think these are something you should absolutely see in person (fall in love and spend all you money, you know, haha), and you can do so by visiting CesarsShop in Helsinki (Vuorikatu 22, 00100 HKI). The glitter payoff is really good and these need 2-3 coats for full coverage. What was your favourite one? On Saturday's post I will show you nails I made using one of these polishes. Can you guess which one it will be? Wau! Ompas sun näkösiä :) Hyviä ostoksia siis! Btw, käytätkö enää peruukkeja ikinä? jep, oon kyl tosi tyytyväinen näihin! Mulla on kaksi F.U.Nia TGIF ja Reunion ( H ). Pakko kai se on vielä kolmaskin ainakin kotiuttaa kunhan päätän mikä. On ne vaan niin mielettömän hienoja!!! King ja Queen kyllä jäivät vielä pikkasen kaivelemaan. Ehkä mä hipellän niitä vielä pari kertaa Cesarsilla kunnes myönnän, etten voi elää ilmankaan :). Ja hitsi sen Galaxyn kanssa, kun mäkin niin odotin sitä! hihii :D toivottavasti saatais galaxy kans pian, se on niiin hieno! Oh my gosh I love the Queen one!!! Ihania!! Onko sulla mitään vinkkejä glitterlakan poistamiseen btw? glitterit lähtee parhaiten pois joko kynsilakanpoistoaineessa/asetonissa muhittamalla, tai käyttämällä peel off lakkaa (esim. O.P.I: Glitter Off) tai muuta glitterin poistoa auttavaa lakkaa (esim. Picture Polish: Revolution) sen alla. Oi vitsit toi Pay Day on siisti *-* Kelpais mulle. Ja toi Galaxy... *kuolaa* Ihanan näköisiä lakkoja, pitääkin kokeilla joskus. 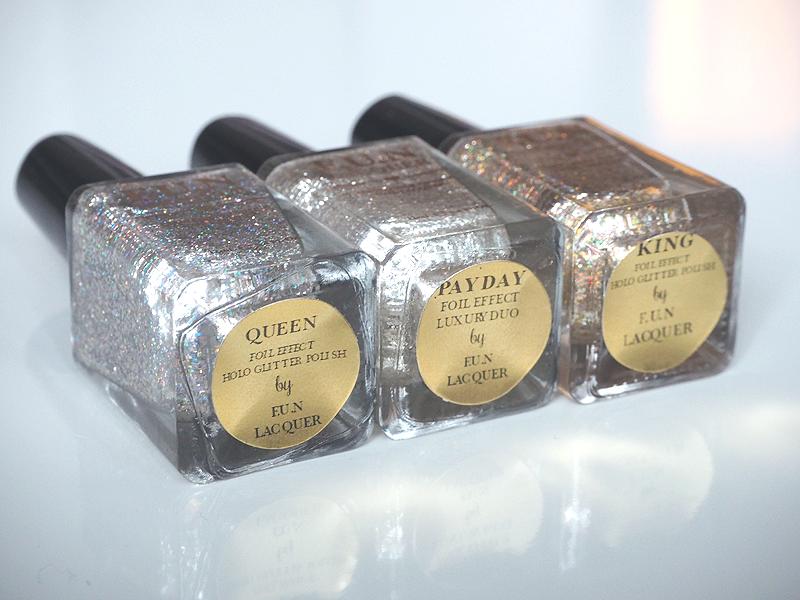 Ooo I love them all but I think payday is my fave!